Season's Greetings, Merry Christmas and Happy New Year! This batrep is just good ol' fashioned fun, featuring some favourite miniatures! We've got Warhammer 40,000 and Godslayer being used today. To navigate to the article for this game on our website, click here. Last year the Grinch finally got some vengeance against Santa when he annihilated the force of Christmas Eldar and defeated the jolly saint himself. Now, captured upon a Trukk and en route to a portal leading to the Grinch's realm, all hope seemed lost for Christmas. However, there was one who noticed something was amiss this holiday season. Meet Inquisitor Aggemmond Queen of the Officio Scriptorum; the office of papers. This domain is the scrutiny of Imperial documents and the legitimacy/validity of said documents. Queen himself has a particularly aggressive lean towards cracking down on Rogue Traders. He goes after the letters of trade that allow Rogue Traders to move freely throughout and beyond Imperial space. He has come across many that are fraudulent, from disgraced houses, or are even stolen. He also cracks down upon legitimate shipping and illegal smuggling; he (more like his retinue) will audit manifests and cargoes and destroy contraband and carry out justice against those who have committed wrongdoings. Queen's attention was drawn when Santa's shipping and cargo paperwork did not arrive. 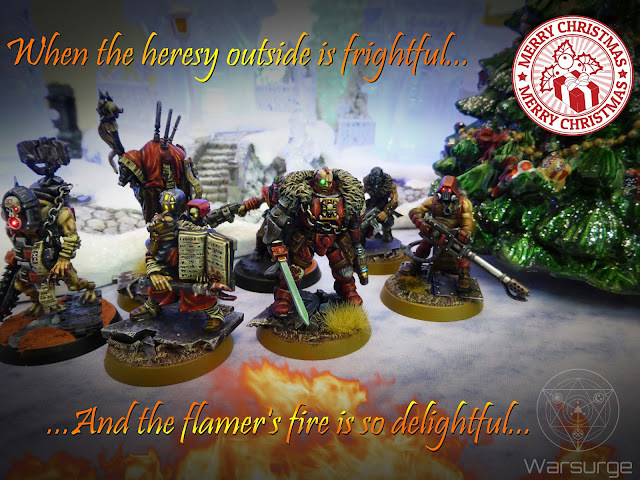 The Inquisitor was disappointed, as Santa was one of the best he had to deal with in his industry. Paperwork was always in order, and always on time. Something was wrong - a number of reasons could be behind it whether from Santa or an outside force, but action was necessary. Gathering his retinue, Inquisitor Queen prepared to investigate. Queen discovered that Grinch had captured Santa and was transporting him. First sending his retinue to deal with the Ork force, Queen soon concluded he'd have to get his hands dirty to deal with the Grinch. In an unfortunate turn of events, Queen was defeated by the Grinch also! He and his retinue had to withdraw. However, Queen and his force had damaged the trukk containing Santa - one of Queen's followers helped see Santa escape before he withdrew with the rest of Queen's entourage. Santa managed to escape and Queen had done his part to save Christmas. Grinch was furious; he had been denied a stomping of the boingloins... again! In Santa's absence, Krampus (the European anti-Santa) had arrived to fill the gap left by Santa. Krampus' duty was to take away naughty children, but had always wanted to be the 'good guy', at even just once. With Santa missing, this was an opportunity he had dreamed of... and was somewhat angry to see Santa return so soon. Like the Grinch, he had been denied also! And for sure, Krampus wouldn't let Grinch take Christmas away. 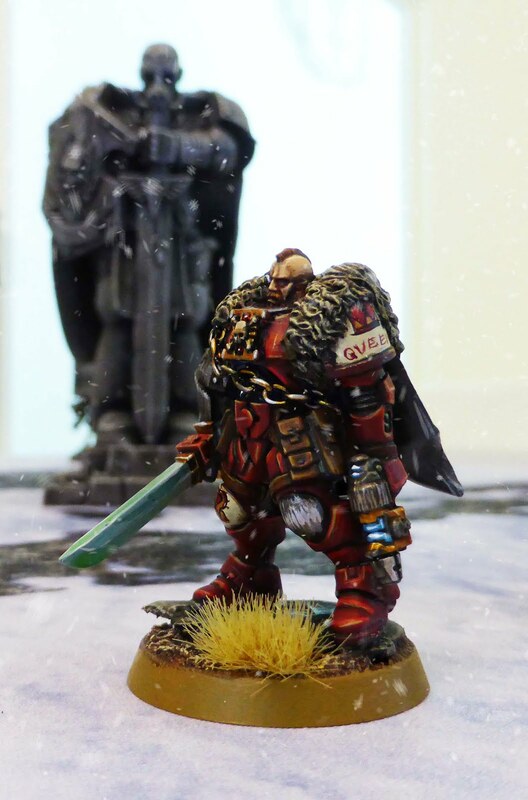 Santa was mustering his newly founded Christmas Marines (from the Blood Angels Chapter) ready to fight against a renewed Grinch attack, but was shocked to see Krampus also entering the fray with his beastly allies. Enraged, Krampus was wanting to fight both Santa and Grinch! A massive Ork, Grinch was prepared 'for a fightin' with Krampus as well. It was going to be a furious battle! This is a three player free-for-all between Santa, Grinch and Krampus. Whoever survives and can claim the central Christmas Tree will win the battle. The board had been divided into three, with the Christmas Tree at the centre. Santa was deployed near his workshop, Grinch was near his portal to the realm of Grinch, and Krampus was in the central area. On the map below, Grinch's army is on the left, Krampus is in the middle, and Santa is on the right hand side. No one was holding punches as the game began. All armies had split some of their army to deal with all the other players. All players were making their way to the central tree. The Grinch battle tank destroyed some Banebrood (Krampus' minions), while Santa's tanks blew up Orks! All sides took casualties. Krampus unleashed the Chimera to try and slay the Grinch, but the beast was bested by the giant Ork (however, Grinch did lose some HP). 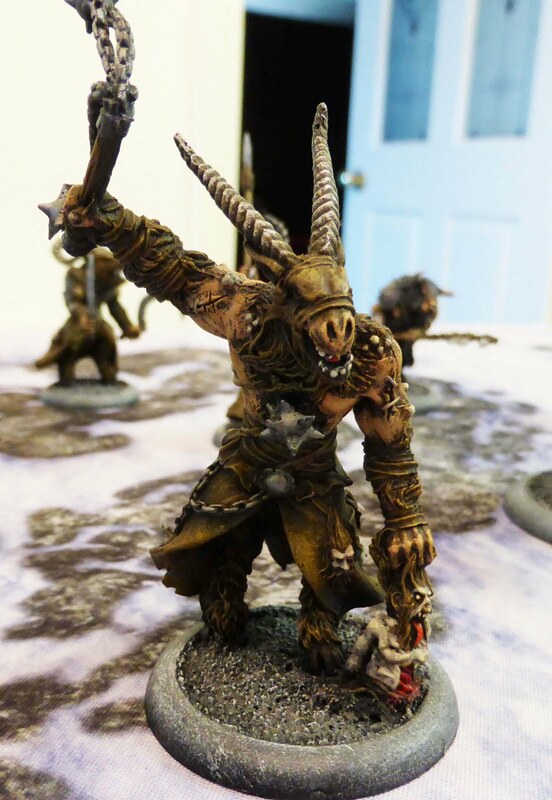 Krampus' shamans blasted enemies with magical power. In this turn, some serious fighting took place. Quite a few of Santa's marines went down, but the tanks were dealing some serious hurt to the Orks. Krampus' minions took the fight to the Grinch's Killa Kans, taking some losses but inflicting damage and destroying a Kan. I suppose as the saying goes... no pain, no gain? Santa disembarked from his Sleigh, and fought, but it was defeated by the Grinch. Krampus made an assault with his minions against Santa, but both sides failed to do any significant damage to each other. Santa's sleigh was gone, but Santa and his allies fought on. There were heavy casualties on all sides, with many of the Orks gone. Grinch was threatening the Space Marine tanks, while Krampus and his minions were fighting Santa in close combat! The cyclops and other beasts were pushing back (and by that, I mean wrecking) the Killa Kans, while the Ork tank was destroyed by the Space Marine Predator. Grinch ended up destroying the Space Marine Vindicator! He avenged many fallen orks in that act. During these turns, Krampus and Grinch were slain, along with most of their forces. Grinch's army was wiped out, the Cyclops remained from Krampus' army while Santa and two marines remained from Team Santa! It was Krampus' shaman that destroyed the Space Marine Predator. Ouch! Santa defeated Krampus in combat, while the Grinch had been taken down by a marine's Melta Gun. Santa was close to the tree, but had a similar amount of army point value left on the table as Krampus' battle force. The Cyclops was a devastating threat, but the game ended. Santa claimed the tree: he was victorious! I guess the cyclops went off to smash some of Santa's stuff. It really wasn't worth disturbing him - Santa would fix the stuff when it got bored and left. Thanks for reading! Happy holidays! Merry Christmas! Click here or on the image below to return to the Warsurge website.